Truck Facts: 2001 Ford Superduty. 572ci Ford Hemi. C6 Automatic transmission with Hurst shifter, TCI race converter, and all aluminum transfer case with quick change gears. 66x43x25" custom cut Firestone-Patented experimental 23 degree flotation tires. Sponsors: Ford Motor Company, MAC Tools, Microsoft, RJS Saftey Equipment, Simpson Helmets, Firestone, Deflecta Shield Corp., Miloden Inc., Flowmaster Mufflers, The Wax Shop, BASF Paints, KC Highlights and many more. Outstanding Achievements: 2000 (Tack) and 2001 (Runte) ProMT Points Champion. Team Bigfoot drivers have won World Championship titles in (1990, 1992, 1993, 1994, 1995, 1996, 1997). Dan Runte dominated the 1996 Penda points series, winning the first 8 of 13 races consecutively. Dan accomplished this feat in 1995 as well. 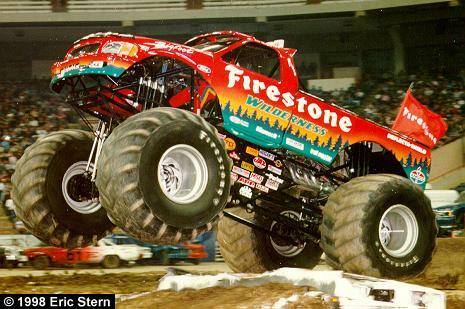 In 1997 Bigfoot trucks won 20 out of 28 races on the Special Events Series. Currently holds the record for the farthest jump in a Monster Truck at 202' 10" over a Boeing Jetliner.